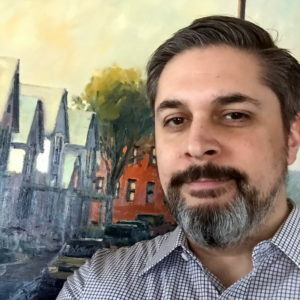 Jeff Maloney, Principal-Urban Design | Vandewalle & Associates, Inc.
Jeff Maloney is a Principal Urban Designer specializing in urban redevelopment, mixed-use neighborhood design, and streetscape/riverwalk design. Jeff has over a decade of experience leading design and public processes for redevelopment projects by envisioning site reinvestment opportunities through place-based assets, preparing site plans, and recommending and designing associated public improvements. He also has experience guiding private projects through the entitlement process, focusing on site design, landscape architecture, and site rezoning. As the lead designer, project manager, and implementation specialist for communities of various populations throughout the Midwest, Jeff is able to prioritize community needs to create a revitalization strategy and associated public improvement program. Successful examples of this approach include TIF District Implementation in Middleton, Wisconsin; riverwalk implementation and waterfront revitalization in Watertown, Wisconsin; and the Baraboo Riverfront Redevelopment Area Plan in Baraboo, Wisconsin. Jeff’s current work includes creating a redevelop­ment vision for a key waterfront site in Sturgeon Bay, Wisconsin; implementing a streetscape vision for the Milwaukee Regional Medical Center in Wauwatosa, associated with the WisDOT Zoo Interchange Project; creating redevelopment concepts and public spaces in Hartford, and designing a riverwalk along the Root River in Racine. In addition to both design work and redevelopment projects, Jeff holds a keen awareness of visual communication. He possesses the ability to visually explain complex planning concepts and continuously develops new methods in graphic communication. Jeff also oversees design team workflow and daily graphic production. You can email Jeff here.